Background The detection, assessment and prevention of adverse drug reactions along the product’s life cycle is known as pharmacovigilance. German pharmacists are obliged by law to conduct pharmacovigilance measures, a specific training is not required. Objectives To assess the knowledge, contribution and perception of German pharmacy professionals regarding pharmacovigilance activities, in order to identify their needs to report better on the issue. Setting A semi-quantitative survey among German pharmacy professionals was conducted in November 2017. Method A questionnaire with 20 questions was developed and distributed to pharmacy professionals in four different German regions. Main outcome measures To assess the knowledge the number of right answered questions were examined; for perception a six-point-Likert was used and for contribution, yes or no questions. Results The participation ratio was 64.5% (n = 127). Nearly half of the participants (47.2%, n = 60) stated that they had already reported adverse drug reactions. Regarding the knowledge questions, there was neither a statistically significant difference between the correct answers of pharmacists and pharmacy technical assistents (p = 0.7209), nor between the different regions (p > 0.5054). For better reporting, the participants recommended better training, shorter forms to fill in and/or a contact person to call. Conclusion For the successful integration of pharmacovigilance reporting in daily practice, we suggest the following: (1) A structured, mandatory training of the pharmacy team. (2) The preparation of a standard operating procedure for the pharmacy or its integration into the pharmacy software. 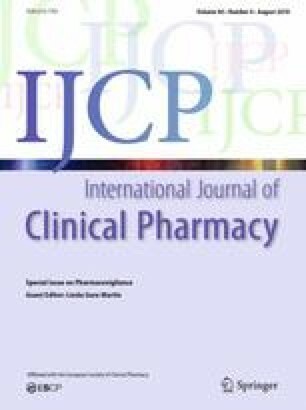 The authors thank Julia Franzen for the statistical analysis in R, John Bradshaw for language editing and the participating pharmacists and PTAs for their time and dedication to furthering the understanding of pharmacovigilance patterns in German pharmacies. This study was not supported financially. Both LA and SK work for Pharmabrain, a company specialising in continuing education for pharmacy teams. FWH declares that he has no conflict of interest. Bundesinstitut für Arzneimittel und Medizinprodukte (Internet). Bonn: BfArM. Eingänge zu UAW-Berichten. https://www.bfarm.de/SharedDocs/Downloads/DE/Arzneimittel/Pharmakovigilanz/Gremien/RoutinesitzungPar63AMG/80Sitzung/pkt-2-1-1.pdf?__blob=publicationFile&v=2. Accessed 23 Apr 2018. German. Bundesvereinigung Deutscher Apothekerverbände e.V (Internet). Berlin: ABDA. Referenzapotheken. https://www.abda.de/themen/arzneimittelsicherheit/amk/wir-ueber-uns/referenzapotheken/. Accessed 23 Apr 2018. German. Bundesvereinigung Deutscher Apothekerverbände e.V (Internet). Berlin: ABDA. UAW Berichtsbogen. https://www.abda.de/themen/arzneimittelsicherheit/amk/amk-berichtsboegen/uaw-berichtsbogen/. Accessed 23 Apr 2018. German. Arzneimittelkommission der deutschen Ärzteschaft (Internet). Berlin: AkdÄ. Bericht über unerwünschte Arzneimittelwirkungen. https://www.dcgma.org/uaw-meldung/. Accessed 23 Apr 2018. German. Bundesinstitut für Arzneimittel und Medizinprodukte (Internet). Bonn: BfArM. Meldung von Verdachtsfällen unerwünschter Arzneimittelwirkungen und Impfkomplikationen. https://humanweb.pei.de/index_form.php. Accessed 23 Apr 2018. Accessible after Login. German. Paul-Ehrlich Institut (Internet). Langen: PEI. Meldung von Verdachtsfällen unerwünschter Arzneimittelwirkungen und Impfkomplikationen. https://humanweb.pei.de/index_form.php. Accessed 23 Apr 2018. Accessible after Login. German. European Medicines Agency (Internet). London: EMA. EudraVigilance: electronic reporting. http://www.ema.europa.eu/ema/index.jsp?curl=pages/regulation/general/general_content_000686.jsp&mid=WC0b01ac0580a69261. Accessed 23 Apr 2018. R Development Core Team. R: A language and environment for statistical computing. Version 3.3.2 (software). Vienna: The R Foundation for Statistical Computing. http://www.R-project.org/. Accessed 23 Apr 2018. Embryotox (Internet). Berlin: Pharmakovigilanz- und Beratungszentrum für Embryonaltoxikologie Charité-Universitätsmedizin Berlin, Campus Virchow-Klinikum Augustenburger Platz 1, 13353 Berlin. http://www.embryotox.de. Accessed 23 Apr 2018. German. DESTATIS (Internet). Wiesbaden: Statistisches Bundesamt Gesundheit: Personal. https://www.destatis.de/DE/Publikationen/Thematisch/Gesundheit/Gesundheitspersonal/Personal.html, Article No. 2120731157004. Accessed 23 Apr 2018. German.